One of my very favorite foods in the whole wide world is broccoli rabe (aka rapini); it’s one of those foods that I had never had until I was all grown up. Well I don’t know how grown up I really am, but I think that my taste buds are definitely more grown up; meaning that as I’ve matured I’ve developed a taste for bitter foods, such as coffee, dark chocolate, lemony desserts, things that I really didn’t like probably until my late 20’s. Broccoli rabe, although it has florets that look similar to broccoli, tastes nothing like broccoli, but more like a slightly bitter green and is packed full of nutrients which help to fight cancer and heart disease, strengthens bones, detoxifies the liver, reduces inflammation, and helps to prevent both hyper and hypoglycemia. I really love to eat broccoli rabe simply sautéed in olive oil with garlic and crushes chilies; and when Billy goes on the road I will often just eat a giant bowl of this for dinner, especially if I’m feeling run down, it picks me right up. Broccoli rabe also pairs well with creamy and sweet ricotta cheese, so to put the two into ravioli just makes sense to me! 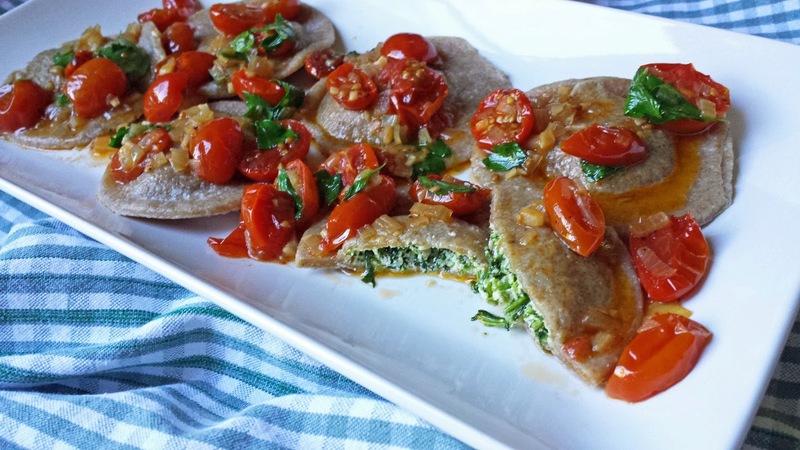 I used Fresh Spelt Pasta on this occasion to make these ravioli, but you could also use Fresh Semolina Pasta, or even wonton wrappers (go here for assembly instuctions using wonton wrappers). A simply Roasted Cherry Tomato Sauce is sweet and fruity and really is perfect in juxtaposition to the bitterness of the broccoli rabe. If you’re a grown up who loves coffee, dark chocolate, and all things lemon, you will absolutely looove Broccoli Rabe Ravioli with Roasted Cherry Tomato Sauce! Now I’m off to make another batch of ravioli because just talking about them has me yearning for more! Get the Roasted Cherry Tomato Sauce started; it's super simple, cherry tomatoes, shallots, garlic, olive oil, and salt & pepper all roasted in a 375 degree oven for 30 minutes. Roasted Cherry Tomato Sauce is sweet and fruity, the perfect complement to the bitter flavor of broccoli rabe. Trim the woody bottoms from the stems of a half of a bunch of broccoli rabe. I like to start the olive oil with garlic and crushed chili peppers in a cold skillet and then put it over med-high heat. As soon as it starts to sizzle, add the broccoli rabe as well as a pinch of salt & pepper. Saute until the broccoli rabe stems are tender, but the color is still bright green. Remove to a cutting board and chop it quite fine, this should yield about 2/3 of a cup. Add the chopped broccoli rabe to a bowl with some ricotta cheese and some grated Pecorino Romano cheese; give it a stir and taste for seasoning, add more salt and pepper if needed. Stir in an egg yolk. Roll some fresh pasta out to a thin sheet that's about 6 inches wide. Drop the filling by the teaspoon full on the bottom edge, leaving about 2 inches between each dollop. Fold the top edge of the pasta over, and using the side of your hand press down to remove any air and to seal the pasta. You may use a 2 to 2 ½ inch round cutter to cut the ravioli; if you don't have a cutter than just use a knife and cut them into squares. Don't let those scraps of pasta go to waste, mold them into a disk, wrap in plastic wrap and then roll it into linguini or fettuccini for the next day’s lunch or dinner. Lay the ravioli on a sheet pan that's been generously dusted with flour. You could freeze the ravioli at this point. To cook the ravioli, bring some water to a simmer and salt it generously. Add a few ravioli at a time. This is my test batch, when I actually cook them I use a large pot and cook about a dozen at a time. If using regular white or semolina pasta they should be done as soon as the ravioli float to the top of the water. Spelt or whole wheat pasta needs to cook for about 2 minutes longer. Toss the cooked ravioli in Roasted Cherry Tomato Sauce and keep warm while the remaining ravioli are cooked. And then sit down and enjoy these babies while thinking of just how grown-up you've become...maybe that last part is just me! 1. In a large skillet combine the olive oil, garlic and crushed red chili pepper, cook over medium-high heat. When the oil begins to sizzle, add the broccoli rabe and season with a pinch each of salt and pepper. Sautee stirring occasionally for 3 to 5 minutes; until the broccoli rabe stems are tender, yet the leaves are still bright green. 2. Remove the broccoli rabe to a cutting board and use a knife to finely chop it. 3. Combine the chopped broccoli rabe, ricotta cheese and Pecorino Romano cheese in a medium bowl. Taste for seasoning, add salt and pepper if needed. Stir in the egg yolk. 4. If using fresh pasta, roll the pasta into thin sheets that are about 6 inches wide. Drop the filling by the teaspoon closer to the long bottom edge of the pasta leaving about 2 inches in between the dollops of filling. Fold the top side of the pasta over the filling and use the side of you hand to remove any air and to slightly press the dough together. Cut around the filling to make the raviolis using a 2 inch round cutter. 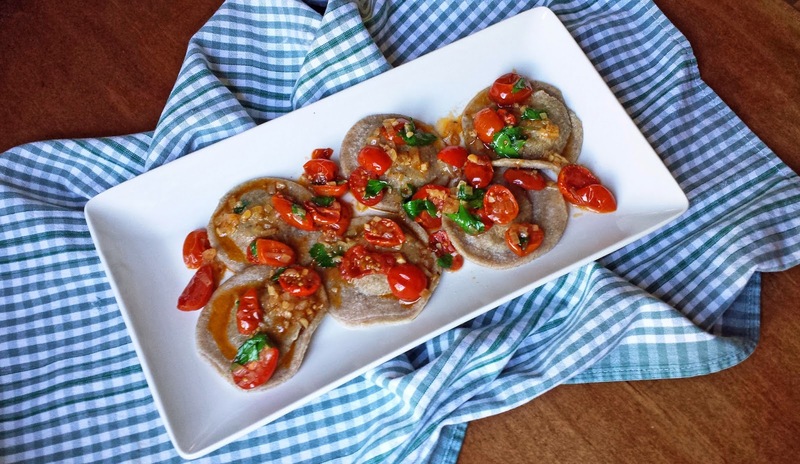 Lay the cut ravioli on to a sheet pan that has been generously dusted with flour. 5. Bring a large pot of salted water to a simmer (not boiling); add the ravioli a few at a time, working in batches (I cook about a dozen at a time). If using white or semolina pasta, when the raviolis float on the top of the water, they should be done and removed to a platter, tossed in sauce and kept warm; if using spelt or whole wheat pasta, when the ravioli float on the top of the water, allow them to cook for about 2 more minutes or until the pasta is done to your liking. Notes: *These ravioli can be frozen. Lay them on a single layer on a parchment lined sheet pan; once they’re completely frozen they can be stored in a freezer bag for a couple of months. **You may buy cooked broccoli rabe at the prepared foods counter in Italian food markets, in that case eliminate step 1. ***Broccoli Rabe tends to be bitter. Some of the bitterness can be removed by blanching the broccoli rabe in boiling salted water for about 30 seconds, and then plunging it into a bowl of ice water to help retain it's bright green color. ****Wonton wrappers are a good substitution for the fresh pasta sheets. 2. Combine all of the ingredients in a baking dish (an 8 x 8 pan, or a pie dish would work well). Roast in the hot oven for 30 minutes. 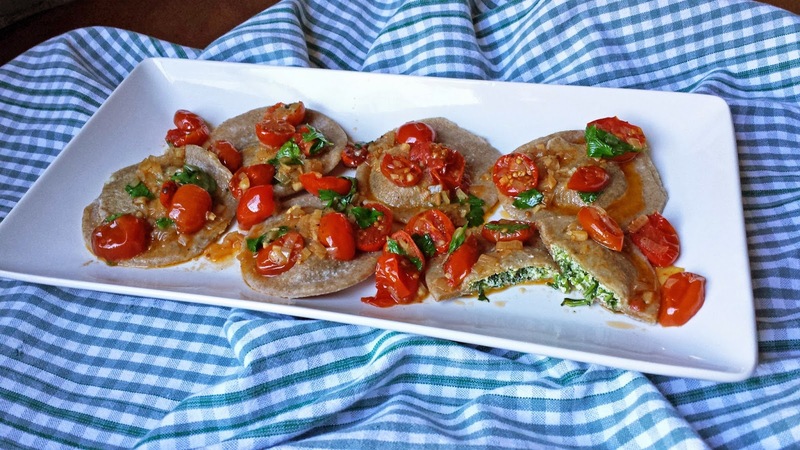 Homemade ravioli with broccoli rabe filling...my mouth is watering, Kari. The tomato sauce looks terrific too. These ravioli sound absolutely delicious! I rarely buy broccoli rabe even though I love it too - just never think to buy it I guess. I've always wanted to make ravioli at home - will ahve to give this a shot : ) And as a grown up who likes coffee and dark chocolate and all things lemony I'm sure I'd love this !